The Big Guy and I had the opportunity to do a little tailgating this past weekend. We brought a variety of craft beers and home brew to share and admittedly to try for the first time. 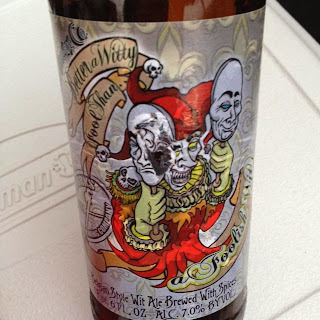 One of those beers was A Foolish Wit by Pipeworks Brewing. I should preface this by saying, I like Witbiers. I'm not drawn to hoppy brews, so I enjoy seeing what else is out there, and really witbiers are right up my alley. Having said that, this was a nice easy drinking beer. It was pretty much right in line with what I'm looking for while tailgating. The beer poured out slightly darker than the light golden color you'd expect to see with a witbier, but it had the characteristic thick, creamy head. There was a nice citrus flavor right away. 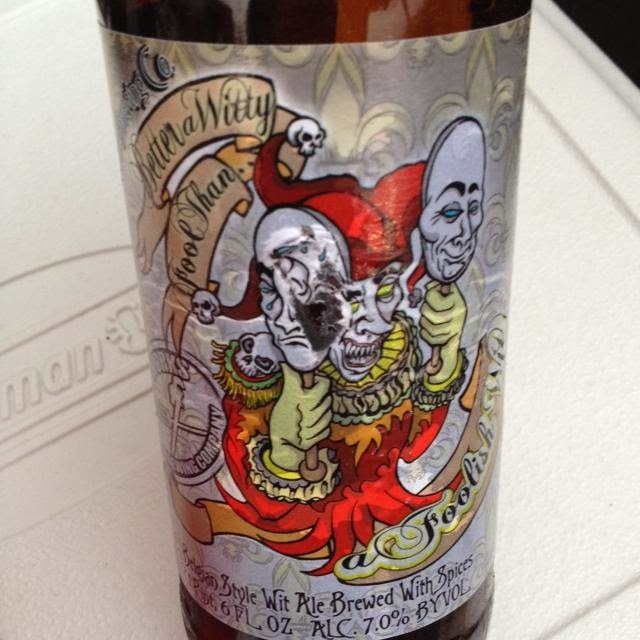 The flavor coupled with the very cold temperature of the beer was actually pretty refreshing. There was a lot of carbonation in this bottle which added to a slightly effervescent feel while drinking it. The flavor had a hint of spice along the way, but nothing that felt really hoppy-bitter or got in the way of the citrus. There was a slight sourness, but just at the very end. It had a very smooth mouth-feel. Overall I gave this one a 3.5.